Debra Lengyell is a graduate of The University of Waterloo where she majored in fine arts. She continued her art education at Mount Allison University. 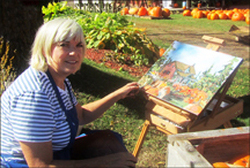 Debra was an art specialist with the Waterloo Board of Education where she taught grades 1-8 art. She took an early retirement in 2011 to pursue art full-time. Debra has exhibited her award-winning art in many galleries and juried shows including Homer Watson Gallery, The Art Gallery of Hamilton, The Etobicoke Civic Centre, Button Factory Arts, Box 13 and the Earls Court Gallery. She has had solo shows at the Berlin Tower at Kitchener City Hall, the Kitchener Central Library Art Gallery, the Minto Art Gallery and the Registry Theatre. Debra is President of the Central Ontario Art Association. She is also a member of Kitchener Waterloo Society of Arts. I paint people and landscapes but, for me, the subject matter is secondary to how light affects things and creates interesting shadows and shapes. Using only one palette knife, I enjoy the texture it creates in the paint. The knife helps me get to the “essence” of the subject and not get caught up in the details. I’m not interested in outside lines either but, again, in the shapes of the light and in the values created in what I see. If I succeed in getting these, then I’ve created recognizable objects. Sometimes it’s a surprise even to me!